Known today across the sporting nation for his on-air commentary as part of the ESPN family, Doug Gottlieb first came into the spotlight as an All- American basketball player at Tustin High School. The Orange County Player of the Year for 1995 initially joined the University of Notre Dame, starting as a freshman and leading the team with 154 assists. 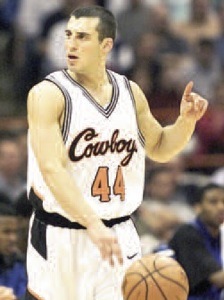 He transferred to Oklahoma State the following year and, as the Cowboys' starting point guard, Gottlieb would guide his team to three consecutive NCAA berths (including the 2000 Great Eight) and earn personal honors as 1998 Big 12 Newcomer of the Year and three straight selections to the All-Big 12 team. He led the nation in assists as a junior with 8.8 dishes per game. Gottlieb would conclude his collegiate career as the holder of all of Oklahoma State's assist records, and currently ranks 10th all-time on the NCAA career assist leaders. Gottlieb was the Oklahoma Storm's first pick in the 2000 USBL Draft, helping the team to a second place finish before signing with Israel's Maccabi Ra' anana the following season. In 2001, Gottlieb played point guard on the gold medal-winning USA Maccabiah team. He would go on to play pro ball in France and Russia, as well as in the CBA, ABA and as part of the Los Angeles Lakers' summer league squad. Along with Bruce Pearl, Gottlieb helped coach the 2009 U.S. Maccabiah basketball team. Since 2003, Gottlieb has been ever-present on ESPN basketball coverage, appearing on both ESPN radio and television as an anchor and analyst. He can currently be heard weekdays on ESPN Radio's The Doug Gottlieb Show.